The One Tenor is a labor of love for life-long Mario Lanza devotee, New Zealand radio and television broadcaster Lindsay Perigo. 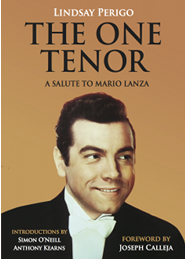 It's the bringing together of his best Lanza-related essays, critiques and interviews over the years, with significant new material exclusive to this book, including Perigo's take on the theory that Mario Lanza suffered from Bipolar Disorder. This theory was first touted in the biography of Lanza by Roland Bessette, with little explication. In The One Tenor Perigo interviews Bessette, who elaborates on his theory for the first time. Perigo responds in his stellar chapter, "Mario's Magic Madness." The author stresses in his Introduction that The One Tenor is not a biography, but a chance to meet the overpoweringly charismatic Mario of screen and record who, in Perigo's opinion, has somewhat eluded biographers hitherto. Perigo argues that the uniqueness of Lanza lay in both his voice and soul, and that any portrait that fails to capture the latter is significantly incomplete. Soul abounds in The One Tenor. The book is exceptional for its musical literacy. Perigo uses his own background as a singing student and connoisseur of voices to maximum advantage. In his time as a broadcaster, Perigo presented a series for New Zealand's National Radio called Singers of Renown, devoted to the great recordings of all great voices. He conducted extended interviews with Joan Sutherland, Sir Donald MacIntyre, Dame Malvina Major, Luciano Pavarotti, Jose Carreras, Licia Albanese and Anna Moffo, along with Mario Lanza's conductor and accompanist, Constantine Callinicos. (The Callinicos, Moffo and Carreras interviews are on YouTube.) His wealth of knowledge about the vocal art permeates this entire collection. Among the diverse features of The One Tenor are Perigo's critiques of several Lanza CD releases of recent times, including the very latest, out just this month, Mario Lanza—The Toast of Hollywood. Youngsters studying voice will find Perigo's observations about Lanza's technique and style illuminating, but these observations are not so technical as to baffle the layman. Perigo's insights into Lanza are further informed by his friendship for many years with Mario's son, the late Damon Lanza, of whom Perigo writes movingly here in Remembering a Buddy. Another gracious feature of the book is that Perigo makes way for another Lanza-buddy and internet radio personality, Jeff Rense, to write a touching guest-memoir. The One Tenor boasts two Forewords, both by outstanding singers: Perigo's compatriot, pre-eminent contemporary Wagnerian tenor Simon O'Neill, and one of the Irish Tenors now enjoying a distinguished solo career, Honorary President of Lanza Legend (see Lanzalegend.com), Anthony Kearns. Both speak glowingly of being awed and inspired by Mario Lanza. Coinciding as it does with the release of the new CD capturing what Perigo calls simply "The Voice" in some of its most dazzling performances, The One Tenor is a worthy addition to the Lanza literature and timely salute to Mario's magnificent voice and spirit.